Dr. Angelo O. Subida, Psychotherapist: What Are You Learning? In seeking God's inner healing, we can learn some lessons from God's created nature. One example is the life of the butterfly. 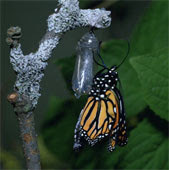 Before a "baby" becomes an "adult" butterfly, it must remain first in a tightly wrapped cocoon. Inside the cocoon, it convulses and squeezes. But while it does, it grows. During this time inside the cocoon, the "baby" butterfly undergoes metamorphosis that provides color to its wings and strength to its body. But some onlookers would try to spare the "baby" butterfly of growing pains inside the cocoon by setting it free! Nature dictates that if the process is cut short, the butterfly will never be able to fly ... I think of some of the inevitable pains, challenges, and struggles we face in life along the way. Let's all be good at them now. After all, like the butterfly, God is adding strength and color to our character through them. And before we know it, we will be flying higher and higher.